Our desire is for you to have the best time possible with the investment you are making on your holiday or move. The decor is modern with a touch of antique, some of the old pieces of furniture lovingly restored around the house. You have a large airy upstairs bedroom that can sleep 3, (King Double + Single/Day Bed) ground floor a standard Queen bedroom & the 3rd is a comfortable bed/study. For the extra guests or visitor stopover a Double/Single Day Bed is in the central open sitting room the front room modular lounge will also make up as a double bed if required. The kitchen is large & free flowing with a light & breezy feel to it. Whether it is cold or hot outside the pool area creates a very relaxing scene. Whitfords shopping center is 3 minutes by car. Hilarys Boat Harbour 5 minutes away with attractions, stores and restaurants. Park & playground are 2 minutes walk. Buses linking to freeway train service runs past 20metres from the front door. A community Gym with sauna, steam room, undercover olympic size swimming pool with various exercise groups 5 minutes away. Golf, there are many courses close by to choose from. Or a stroll through Pinarroo a local reserve with hundreds of Kanagaroos quite OK to have you walk amongst them, all free. If you are looking for a place to relax in but also have the opportunity to explore from this place is for you. A car would be handy but you don't need it if you are OK with Perth's very efficient public transport system. The home would suit an executive couple as a retreat or a family wanting to live the experience. We also enjoy assisting emigrants moving to our fantastic city. We offer an Australian postal address along with referee as we can be your first trusted business contact in Australia. All this is possible through the trust of this website booking offer. Uniquely set out this home offers the right amount of space. There is ample room for privacy for the members of your group with the upstairs, front TV Room , 2 other Bedrooms & Living Room offering comfortable areas to relax. When the weather is right for it the pool and deck area are the place to be. We have a lovely caretaking couple living in a completely separate portion of the home leaving a fully furnished and appointed 3 bedroom, upstairs - downstairs modern decor home for you to enjoy in complete privacy. Also we have a bottle of wine for your pleasure to extend the hospitality of this lovely home. Had an amazing time. Beautiful house , everything you need, well equipped kitchen. Great outside area, had family round for dinner, perfect for entertaining. Pool bigger than looks on photos. Shops within walking distance. Keith was great, making sure we had everything we needed. Lovely and clean when we arrived, bottle wine waiting for us . Would definitely recommend this accommodation. Had a wonderfull Xmas and New Year. We enjoyed our stay at the Padbury Guest House. Everything one would need is provided and the place was clean and comfortable. Would definitely stay again! We stayed in July (winter). The house is not fancy but very comfortable. There is a lot of room. It is equipped with just about anything you might want. You should note that there is a washer, not a dryer. There is a twirling clothes line outside and an indoor drying rack. Most of the year this would be fine. It was a little iffy when we were there since the weather was a little damp. The bedrooms are spread out so you can have privacy even when traveling with a group. The kitchen is quite large so there is room for a group and cooking. The house is in a quiet suburban neighborhood. A great location if you are traveling with family. The beach, city, and national park are all nearby. The owner was wonderful to deal with. Great communication and everything was like we expected. 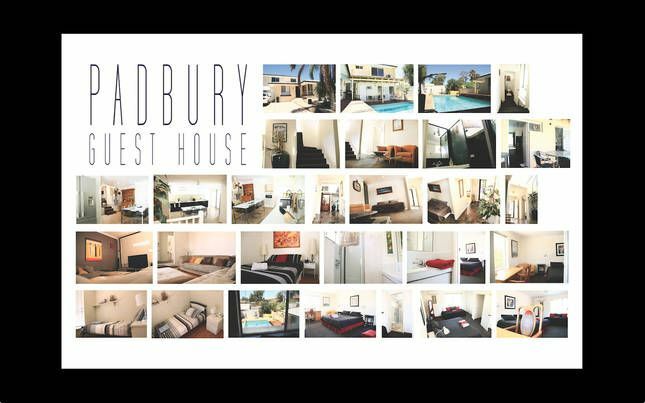 I would highly recommend this house as a place to stay if you are visiting the Perth area. Bright & airy comfortable with all you need. The house is quite nice & comfortable with space to be together or apart. We found the pool & theater room entertaining. Everything we needed was in the home & the upstairs bedroom is a nice retreat from the crowd. Lovely stay, thank you. The home is interestingly laid out with helpful caretaker assistance resident in the other half of the house. Still quite private, peaceful & relaxing. Hillary's Boat Harbour is close & a great place for kids & shops. The area around the home is quiet with parks & safe walks. Property is clean & welcoming. Very nice.